Product information "HAIX Black Eagle Safety 52 Low"
Black leather work shoes are taken to a new level of comfort and construction with the Black Eagle Safety 52 low shoe. These waterproof black work shoes are just 3 inches tall. Although these leather slip resistant work shoes may feel more like athletic footwear than a safety shoe, the Black Eagle Safety 52 low gives you protection the whole time you are on duty. These waterproof black work shoes are super lightweight, and will make you feel athletic when walking and moving. The metal free design keeps you safe from electrical hazard, while the CROSSTECH® inner liner provides waterproof protection which is breathable and light. The composite toe cap material ensure light and comfortable toe protection. With sizes from 4.5 to 15, there are leather slip resistant shoes for every foot. Made of European leather, these waterproof black work shoes offer long lasting good looks and durability. Sun Reflect treated leather aids in keeping a cool and comfortable inner climate. Pair that with the HAIX Climate System and your feet are going to thank you for keeping them cool and comfortable all day long. Sporting a carbon composite safety toe cap, your toes will thank you if they ever get in a pinch! Its rubber edged toe cap prevents your toes from feeling the pressure of the toe cap edge you can sometimes feel in other safety shoes every time you take a step. When you are in a hurry, use the rear pull tab at the top of the heel to pull these leather slip resistant shoes on fast. The quick smart lacing feature save you the hassle of having to tie your shoes, and the laces stay neatly tucked away under a storage flap at the front of the shoe. The HAIX® Black Eagle Safety Boots come with a removable, antibacterial insole which is designed to cushion and protect your feet. It also does double duty as a cushioning pad which is moisture wicking. The insole material is moisture wicking to keep you dry under any conditions. Prevent standing fatigue with the arch support of the Black Eagle Safety 52 low, it hugs your heels and supports your arches in all the right ways. Pronation support in the mid and insole area help your feet absorb shock and adapt to walking on uneven surfaces. Black Eagle Safety 52 provides protection without sacrificing athletic performance especially when spending a lot of time on their feet. Metal free puncture protection is a standard part of the HAIX® Black Eagle Safety Boot, keeping you safe from puncture hazards. The outsole is designed to be non-marking and will provide all weather grip from heel to toe. Specially patterned sole provides exceptional grip with wide enough spaces to avoid rocks and other materials clinging to the bottom. The sole is oil, fuel, and skid resistant. In addition, these oil resistant shoes are rated for electrical hazard resistance. The sole on the Black Eagle Safety Boot can be re-treaded as well providing you with many more years of shoe life. Related links to "HAIX Black Eagle Safety 52 Low"
Customer reviews for "HAIX Black Eagle Safety 52 Low"
Very comfortable. Safety toe is great. Purchased this shoe in February 2016. Had a small dimple cut on the tow cap, built up with shoe polish and is good as new. The only duty shoe for me. Laces are always secure. I wear these 16 hours a day, feet never hurt like other shoes. Took a long time to get used to wearing this shoe. Came new with cracked toe leather. Called to have replaced but the guys convinced me it was gonna get messed up worse after a few days. The toe wears very easily. Only had these for about 6 months and they look worse than my 3 year old pair of 5.11s. I would recommend buying a model that comes with a covered toe instead of the exposed leather. We appreciate your feedback on the Black Eagle Safety 52 Low. We apologize that the leather toe wore down so easily while on the job. In the future, I would recommend that you if you have a job that puts boots to the test you may want to consider one with a toe cap. 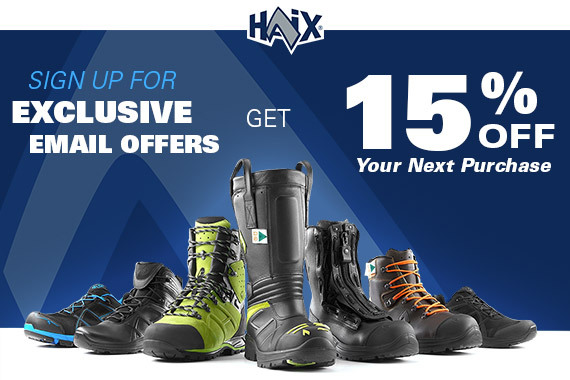 We certainly hope this will not deter you from considering the HAIX brand in the future. Comfortable shoe. Toe definitely wears too quickly, would agree with another review that shoe needs a toe cap. We appreciate you taking the time to give us feedback on the Black Eagle Safety 52 Low. I will make sure to pass along your concerns about the toe cap but we are happy to hear that you find the shoes so comfortable.